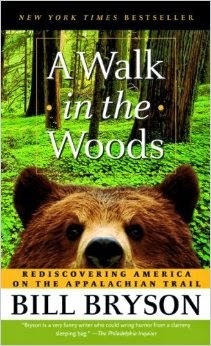 Our daughter is working in Atlanta on the film adaptation of the book A Walk in The Woods by BillBryson. (We are currently reading the book.) She has a few days off over the Easter weekend so it’s a good time for a visit. We drive directly to the production office outside of Atlanta and park Dimples in the guarded lot. She will be safe and secure during our visit. After meeting our daughters colleagues we head over to her rental; a cute brick bungalow on a tree lined brick road in a historic neighborhood. The Southern Classic Benedict – Poached eggs over Canadian bacon on a buttermilk biscuit with country gravy and fresh fruit. Red Flannel Hash - A hearty mixture of corned beef, Idaho potatoes, peppers & onions topped with two eggs any style. Served with creamy stone ground grits & buttermilk biscuit. Love Me Tender Waffle - Belgian waffle topped with crispy chicken, cheddar cheese eggs & thick cut bacon. Roasted Moulard Duck Brest with grilled radicchio, peperonata and compressed Georgia Apples, Bone-in pork chop with spicy collard greens and bacon jam, and the special red shrimp dish. 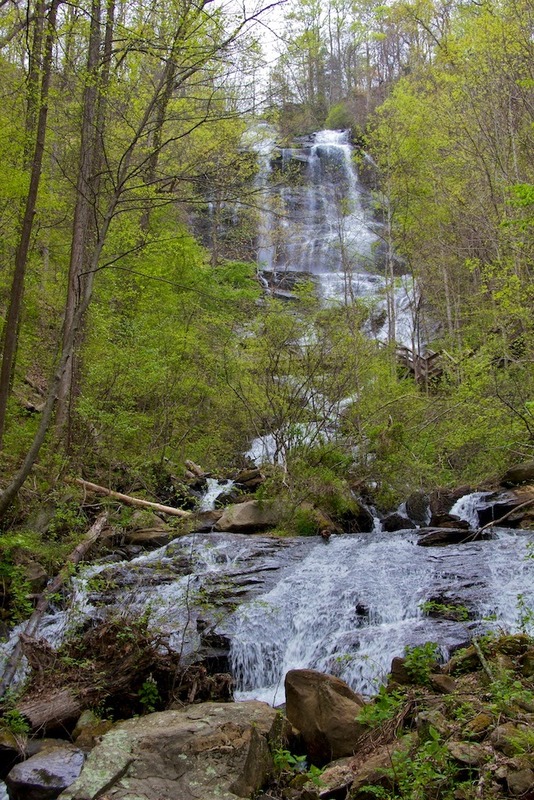 On Easter Sunday we pick up Dimples and head up to the Amicolola Falls State Park, where filming starts the next day. 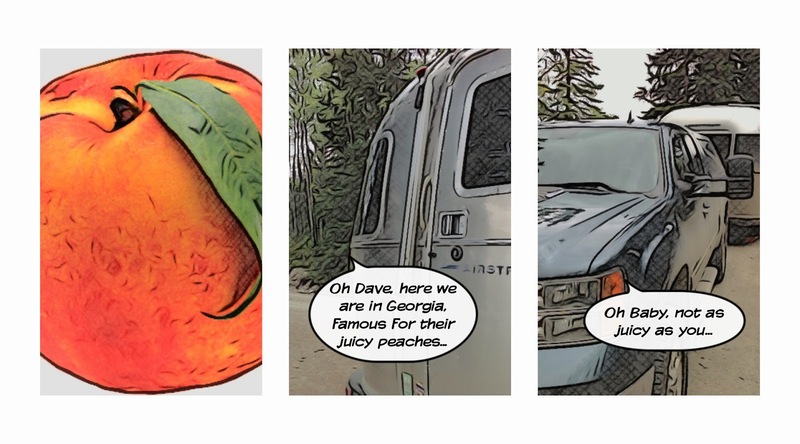 The road to the Amicolola Falls Lodge is a 24% grade, nothing that Dave can’t handle. We just cruise right up but our daughter can’t keep up with us in her rental car. (Gotta love a Diesel!) 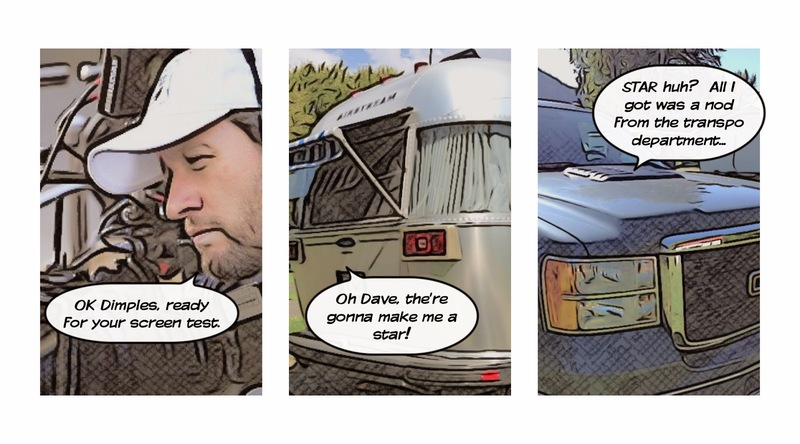 We stay in the lodge RV Park. The park is located on a hill above the lodge, great views, large spaces with BBQ, fire pit and picnic table, there’s even a laundry room. The cast and crew stay in the lodge and another nearby resort. The Staff of the Lodge are exceptional during our stay. Dealing with the Hollywood invasion and the other hotel guests who were inconvenienced. After we check in we head to the falls. Four hundred seventy-five steps down to the mid point of the falls. It’s easy going down, not looking forward to the return trip. The view from the bridge over the middle of the falls is spectacular. Just as we are about to head back up, we get a text from our daughter. She wants to come join us. There’s a parking lot and an easy access trail nearby, so she drives down, takes some photos of the falls and we all drive back up. 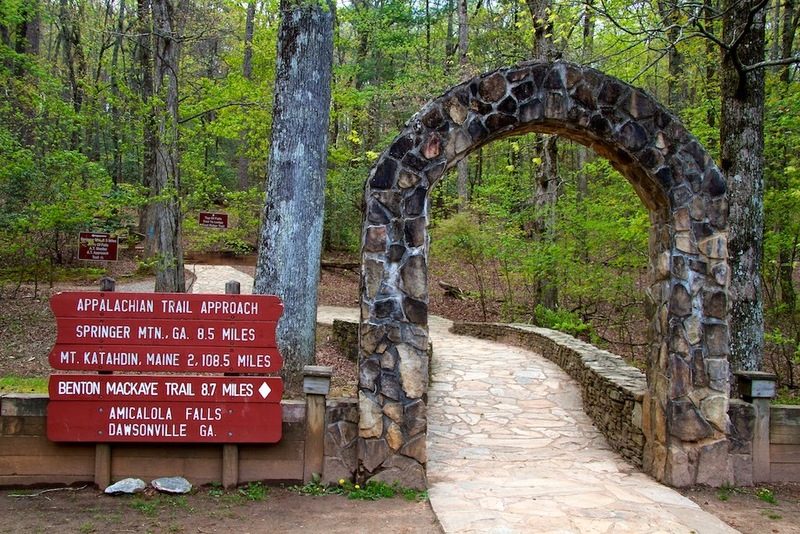 The next morning we stop by the visitor center and watch Robert Redford and Nick Nolte walk through the approach arch to the Appalachian Trail, (hereafter referred as the AT) and walk through again and again. Some folks might find this exciting – right like watching paint dry… So we set off to do a little hiking. Off Forest service road 42 is a parking lot across from the AT approach trail. 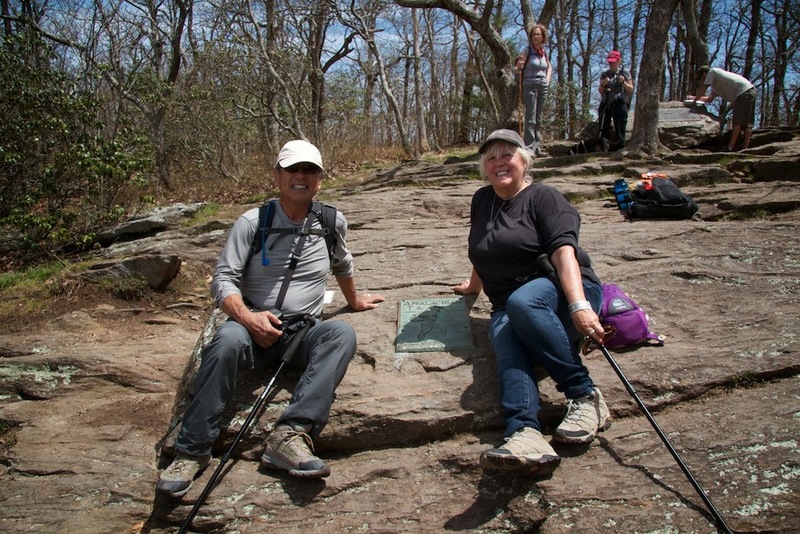 We hike up about a mile to Springer Mountain – the official southern terminus of the AT. 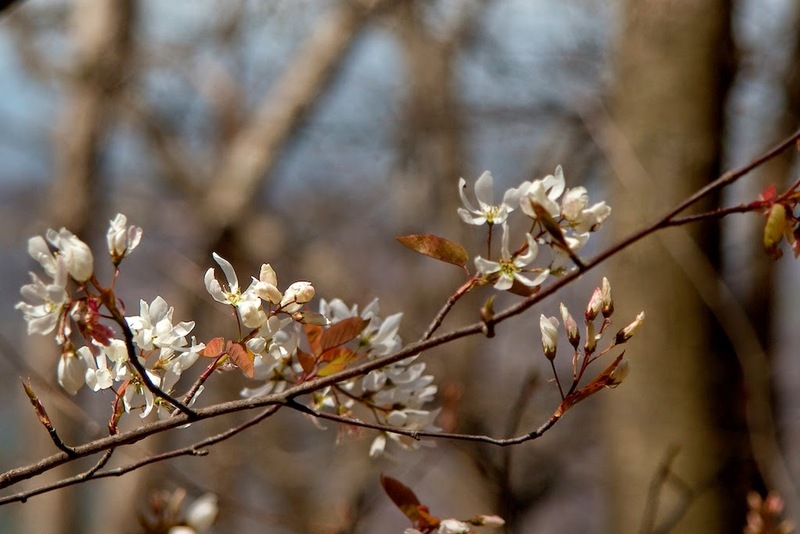 It’s a beautiful spring day and trees are starting to blossom and wild flowers poke out from nooks and crannies. On our final day we hike in the morning to the bottom of the falls from the visitor center. By noon it’s raining, so we head to the lodge to use their WIFI to plan our next location. They’re filming in the lobby and the restaurant. It’s a zoo! Equipment and technicians are everywhere. We stay out of the way by camping out on the third floor balcony. After they wrap we bid them all farewell as they head back to Atlanta. 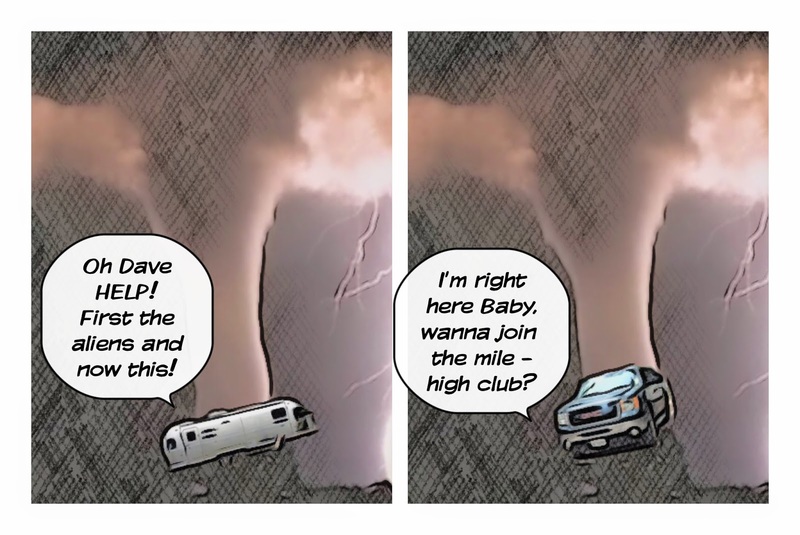 They have thirty more days of this craziness… we only have to get up tomorrow and head to Cherokee, NC. Reading A Walk in the Woods and seeing a bit of the movie making has given us an inspiration for this summer’s travels. 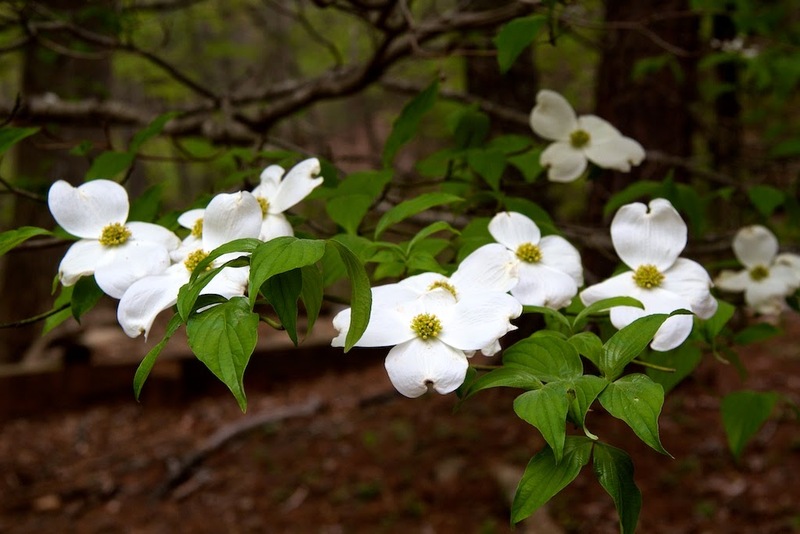 We have a general notion to eventually get up to Maine… so why not follow the AT? Now it’s onto Savannah and the Red Gate Campground and RVResort. 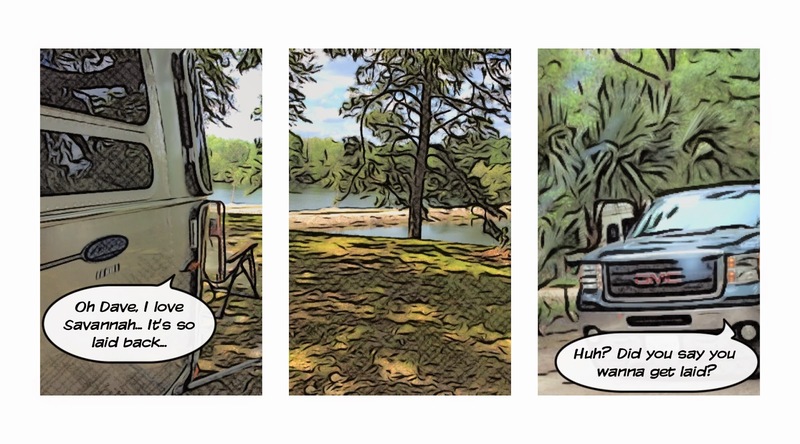 We arrive and our space is water and electric only… but the good news is we are off away from the main campground, nestled under the Spanish moss draped oaks with views of the ponds. This family farm turned RV Park has great history and was a Confederate and later a Union encampment during the Civil war. 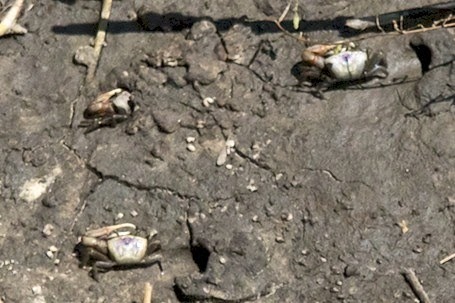 They still find Civil War artifacts on the land. As we arrive in Savannah, pink tutu clad folks have just finished a Susan G Komen Race for the Cure. We stroll through the historic district. This is a spectacularly beautiful city. It reminds us a bit of Boston… but Boston on Prozac. No one is in a hurry. 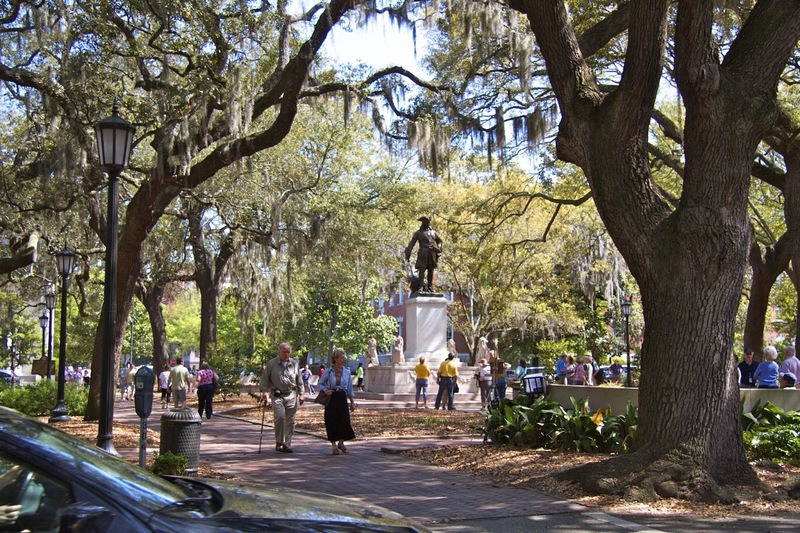 In the historic district, every few blocks is a city square with statues or fountains and the ever-present moss draped oaks. This is definitely a walking city. We stop by the Cathedral of St. John TheBaptist the oldest Roman Catholic Church in Georgia. This is truly a beautiful cathedral with all the trimmings: frescos, stained glass, statues… the works! After, we stop at the Moon River Brewery for some tasty adult beverages. The couple next to us orders brews that are served in a different glass. Curious. We inquire and are introduced to Kentucky Bourbon Barrel Ale… Thank you young couple from Cincinnati, Ohio On our way to the waterfront there’s a Tea Party Rally in the park. 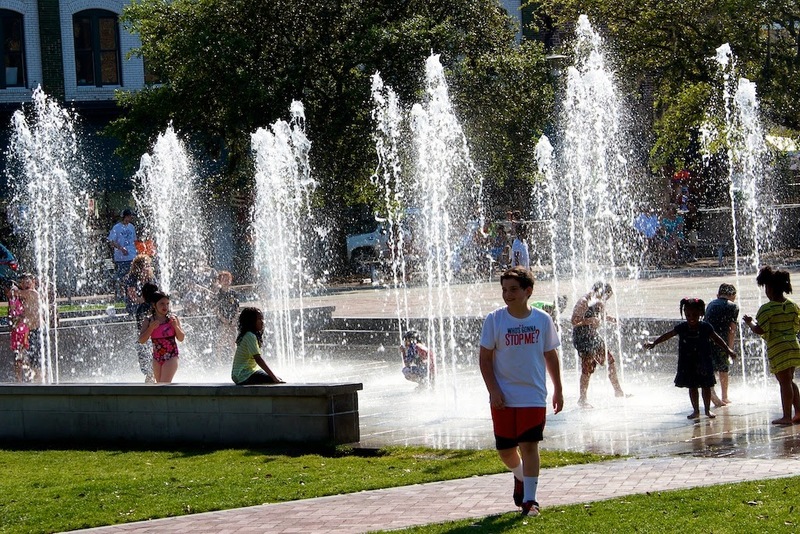 Not much of a turn out tho… there are more kids splashing in the fountain. Along the Savannah River there are lots of touristy shops and restaurants. We grab a hot dog from a cart and watch huge ships come up the Savannah River. On our way back to the parking garage we pass through the park, the tea party is over and the fountain is still full of splashing children. 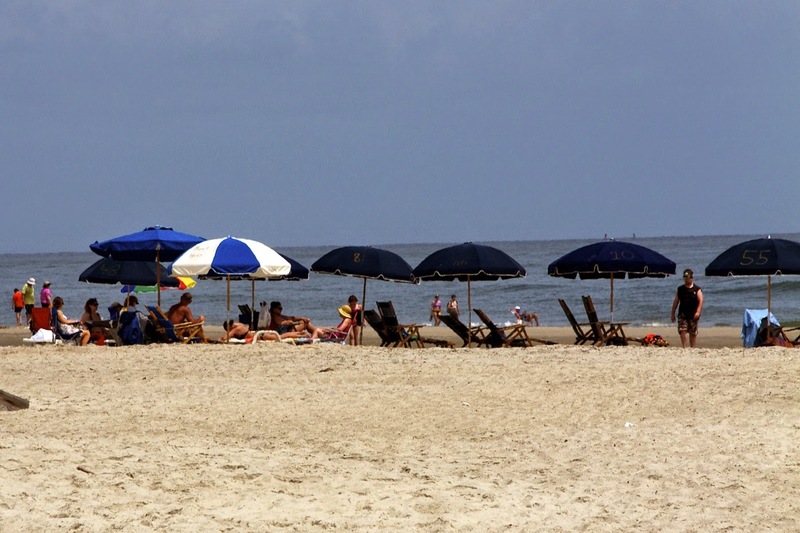 Tybee Island is Savannah’s beach. Every April for almost thirty years, college students have an impromptu beach party: Orange Crush. Town officials try to guess the date but it’s a social media event. It doesn’t happen while we are here. The Beach is quiet. 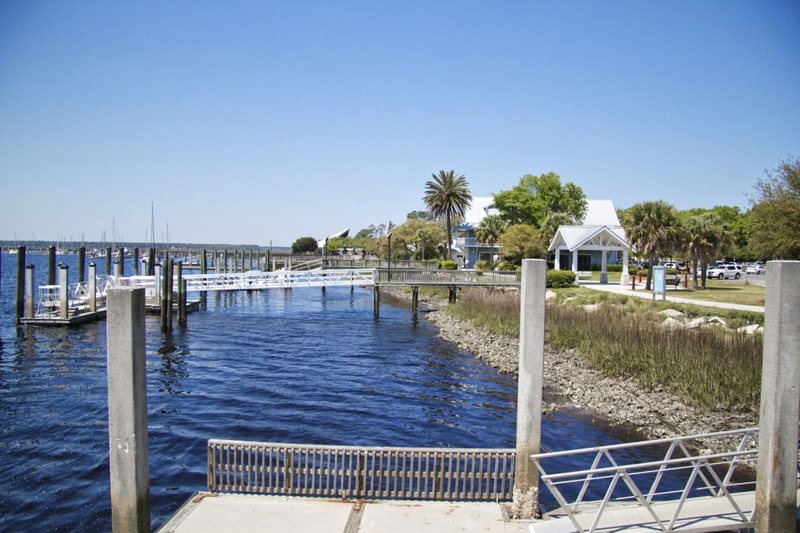 The Tybee Island Museum is located within the walls of Battery Garland of Fort Screven. It’s a strange museum with continuity issues, limited artifacts but lots of laminated posters with information about the island. Battery Garland was constructed in 1898-1899 to mount a huge 12-inch “non-disappearing” rifled, long-range cannon. 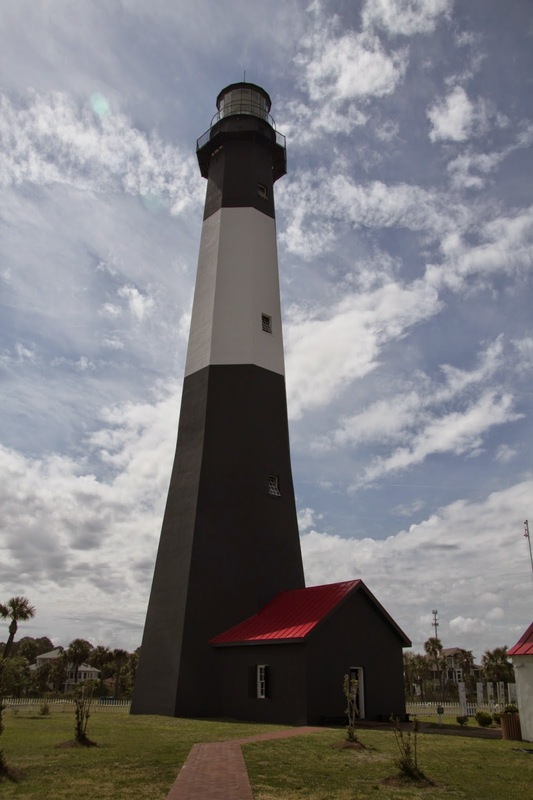 Across from the Battery is the Tybee Island lighthouse. We tour the grounds and light keeper’s cottage and climb up in circles for what seems like forever (ok it’s only four stories) to the top of the station for some incredible views of the area with a little acrophobia as the walkway seems a bit sketchy. (Guess that’s why they only allow 25 visitors up at a time. 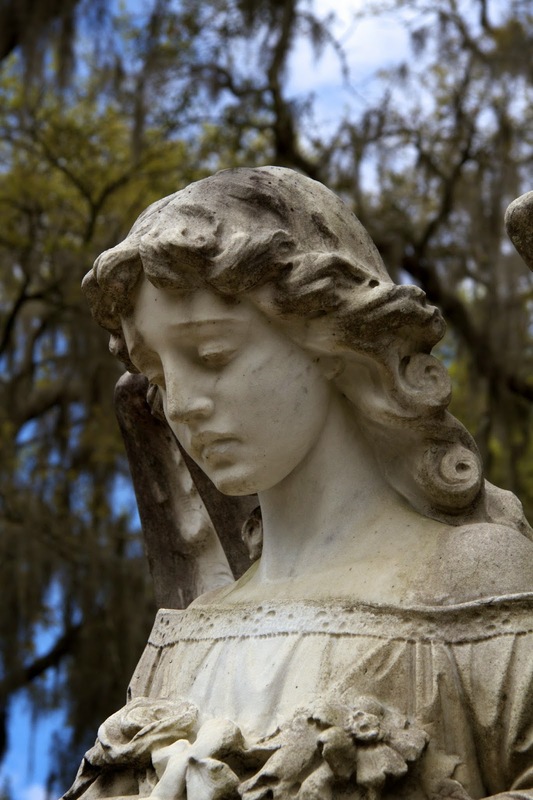 The Bonaventure Cemetery is located on a scenic bluff on the Wilmington River, east of Savannah. It’s 160 acres of breathtakingly beautiful filled with history and pseudo-history. It was featured in the 1994 novel, Midnight in the Garden of Good and Evil by John Berendt and the movie based on the book. In 1867 John Muir wrote his chapter “Camping Among the Tombs” about his six days and nights sleeping on the graves as it was the safest and cheapest accommodation he could find while waiting for money to be expressed from home. It is the final resting place of Oscar Wilde, Johnny Mercer and Conrad Aiken. It’s a “World’s Most Haunted Cemetery” in a World’s Most Haunted City. (Not sure how they qualify this.) But there’s really nothing creepy here… just a sense of beauty and tranquility. Fort Pulaski sits between Savannah and Tybee Island. Originally built as a main defense against overseas enemies it stands as a landmark for the turning point in Military History. During the Civil War the Union army blasted the masonry walls with a rifled cannon, breaching the perimeter. Ordinances landed perilously close the Confederate munitions supply compelling them to surrender. 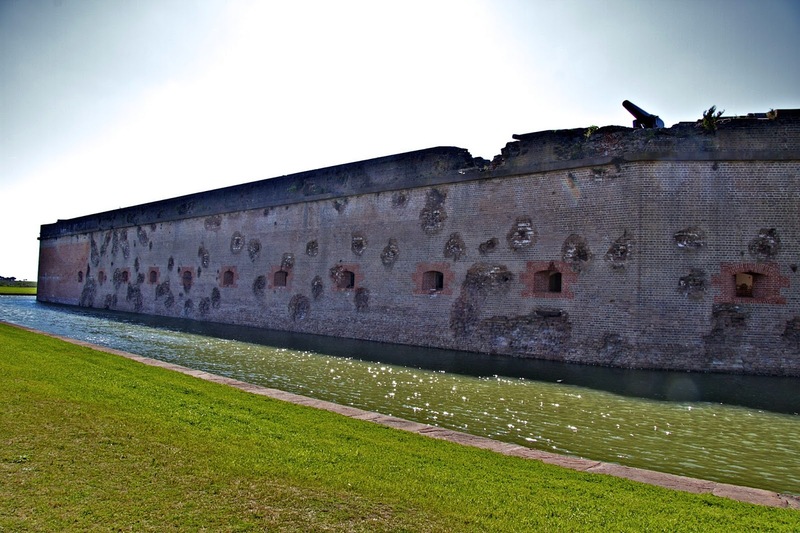 The breech in the exterior walls was immediately repaired once the Union took control, but the exterior walls still show the ravages of war. 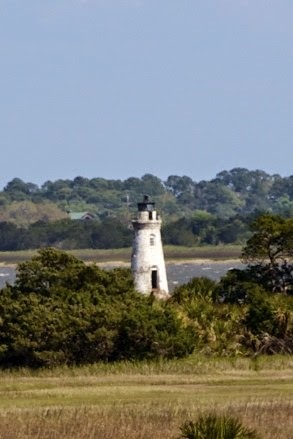 The Cockspur lighthouse sits off in the distance marking the south channel of the Savannah River. 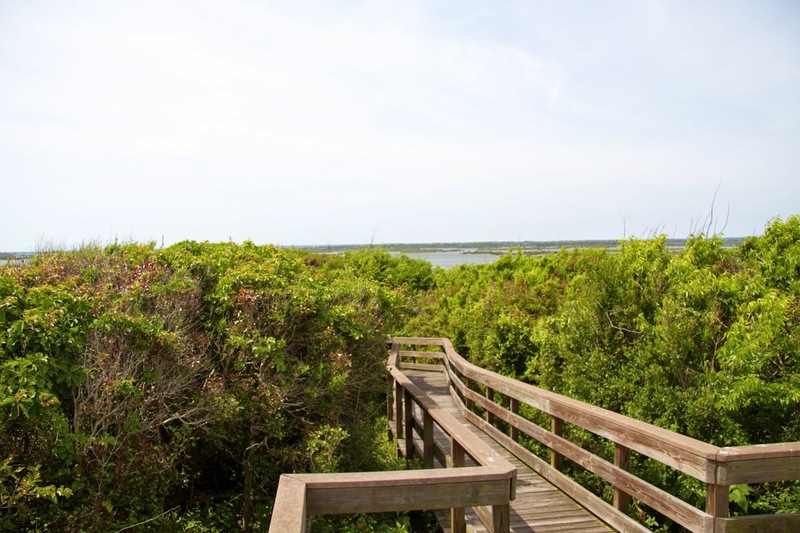 Although open to the public, it is only accessible by foot during low tide. Traveling under sunny skies we leave the Sunshine State and cross the border into Georgia. First stop the Walkabout Camp and RV Park in Woodbine. Our Aussie host greets us with a “G’day” and enthusiastically tells us about area attractions. We ask about a seafood place that we passed on our way in and he tells us that it’s the absolutely best place in the area for fresh local oysters, clams and shrimp. 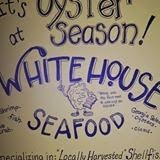 So as soon as we get un-hitched and set up we head over to WhiteHouse Seafood to procure some local delicacies. The place is about as low key as you can get. It’s clean and quaint. Large plastic coolers filled with shrimp, cod and scallops, a couple of glass front refrigerators and lots of fishing gear on the walls. Karen Sharpe owns this place with her husband Richard; he does the harvesting of oysters and clams in the near-by intertidal salt marshes, she sells them. We check out the shrimp in the cooler and decide to pick up a couple of pounds. Then Karen asks if we’ve ever tried Georgia oysters. Since we’ve never had this variety, she promptly heads to the walk in cooler and returns with a hand full, which she quickly shucks. She warns us that they are much saltier than other varieties. 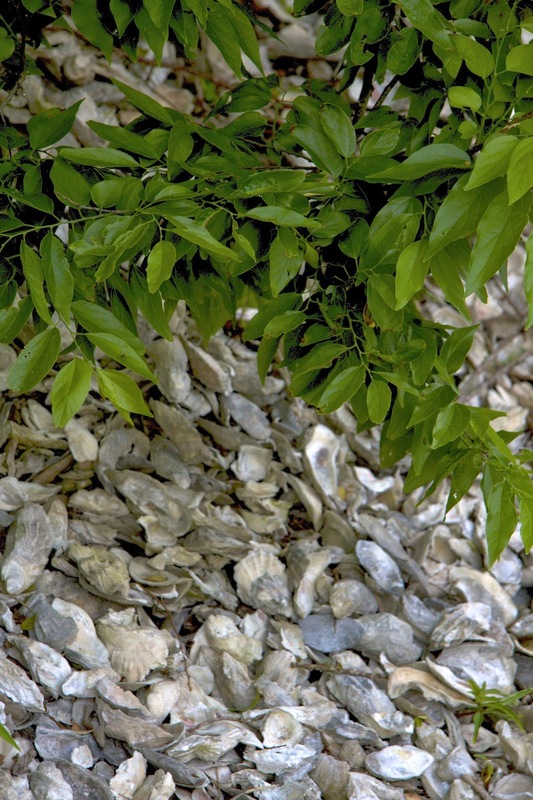 While we slurp the briny bi-valves Karen shares how the wild oysters grow in vertical mounds, shells forming on top of each other with thin shells that are sometimes difficult to shuck. Yep they’re salty, but delicious! So we pick up a bag of oysters and add a cod fillet to our order. Back at Dimples we mix up some tempura batter and feast on fresh tempura shrimp, oysters & cod. Doesn’t get much better than this! The next morning we head over to St. Marys. 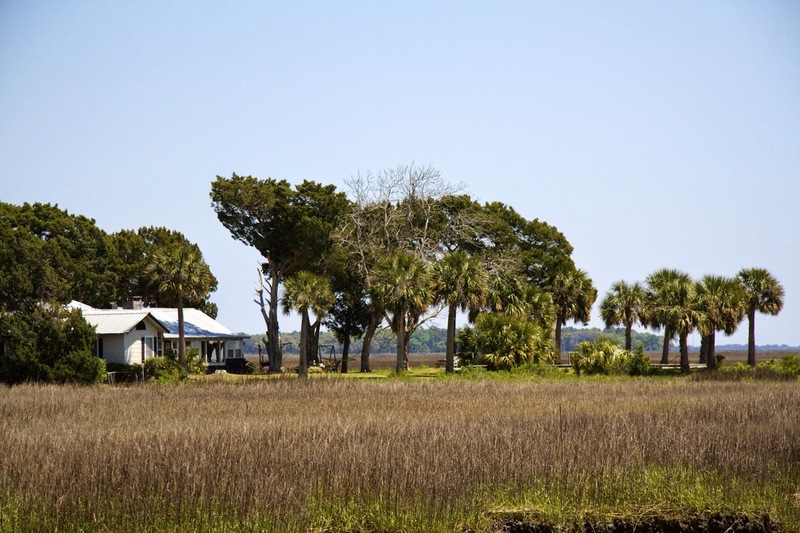 Once home to pirates, smugglers, it is now the gateway to the Cumberland Island NationalSeashore. From New Iberia we jam eastward through Mississippi and spend the night just east of Mobile at the Riverside RV Resort in Robertsdale, Alabama. When we check in we are advised that the laundry room is safe and to head inside if the weather gets violent. We’re not interested in experiencing even a tornado watch so we get up early the next day and continue on. 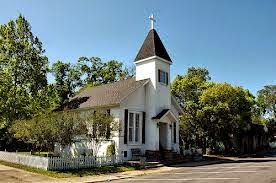 Our next stop is Old Town Florida. 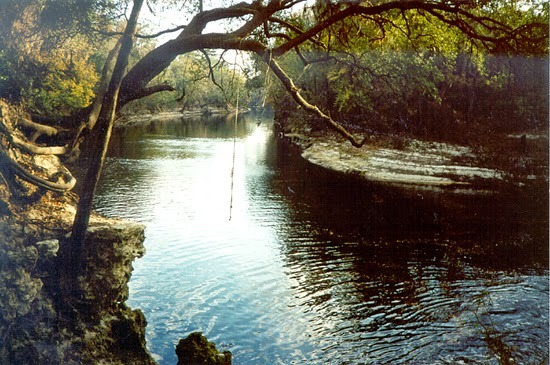 This tiny hamlet is on the Suwannee River made famous by Stephen Foster’s song Old Folks At Home (The Florida State Song.) Even though the song was originally about the Pedee River in Arkansas, but changed it to Swanee at the suggestion of a friend. Weather permits only one day to check out the area and pick up supplies. After viewing all these discarded shells, WE NEED OYSTERS… so… we check our urban spoon app and head over to Off The Hook Raw Bar and Grill. We start off with cocktails and a half dozen Louisiana oysters on the half shell. They are fresh plump and tasty. From the Specials menu we select the BBQ fried oysters with blue cheese. Batter is crispy, oyster succulent and the sauces zesty. Then the blackened Cajun oysters, no batter just tasty with lots of seasoning lightly seared. We finish off with the Grouper bites, lightly seasoned and flash fried. We are in Oyster seafood heaven!